We talked earlier this week about Cardinal rivals when we looked at the Pittsburgh Pirates. If there’s been a post-season rivalry over the last few years, it’s been with the San Francisco Giants. Of course, in a real rivalry both sides win sometimes. Here lately, even though the Cards win some games, it always seems to be the Giants winning the series, whether getting a remarkable performance out of an unlikely source in Barry Zito or watching Randy Choate throw the ball into the stands. The bounces have gone the Giants way at times, but they’ve been able to capitalize on them and take home the grand prize three times in five years. Will they be able to break this even-year-miss-playoffs part of the cycle? To address that, we’ve got three San Francisco bloggers lined up to blast away at the Pepper questions. First, many of you remember Craig from our interactions in the postseason. Craig’s site, THE San Francisco Giants Blog, has been nothing but gracious and accommodating when I’ve stopped by. (Craig’s answers are on this thread if you’d like to see the opinions of his commenting crew.) He Tweets @1flapdown77. Following him is Richard, who plies his trade over at The Giants Cove on the Bloguin network. Follow him on Twitter @GiantsCove. Finally, we have Kevin from SF Lunatic Fringe. 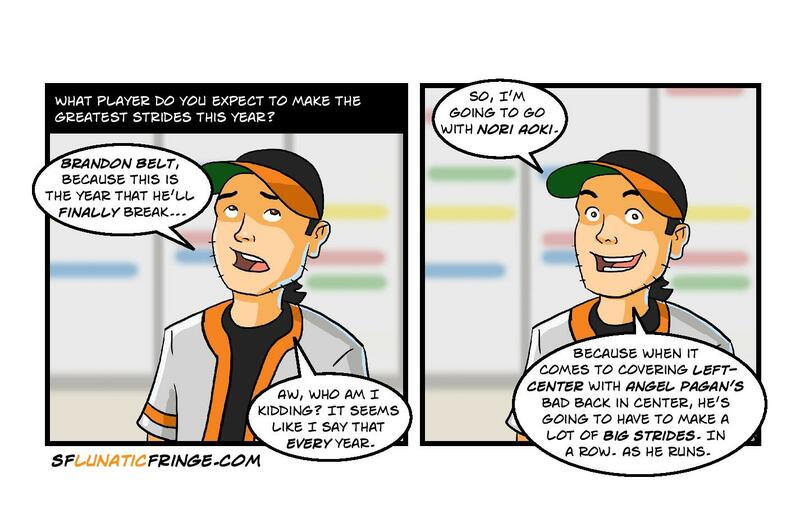 As always, Kevin has provided his answers in the comic format that highlights his blog. He’s on Twitter @sflunaticfringe. C70: What are your thoughts on the team’s off season? Did they do what they needed to do? TGC: For a Championship organization, the Giants’ recent offseason was dormant and unproductive– for two reasons. First, the Giants were rejected by a number of free agent players, even when they offered more money. San Francisco offered Pablo Sandoval $100 million for five years; Boston signed him for $95m/5 years. Reports are that San Francisco also offered Jon Lester and Chase Headley more than the Cubs and Yankees did—but they signed (respectively) with those teams. The Giants have the wealthiest ownership group in the Majors (in fact, according to Forbes.com, the 5th wealthiest in all pro sports). But after falling short to attract premium free agents, they apparently decided not to invest any more than they had to in 2015. So to replace the significant offense lost with Pablo Sandoval and Michael Morse, the organization went cheap. GM Brian Sabean picked up Kansas City castoff Nori Aoki and Marlins castoff Casey McGehee, both inexpensive, marginal players. C70: What does this team do so well in the post season when they get there? TSFGB: They act like they’ve been there and because they have been there they have a different mindset than other teams. They don’t freak out and throw stuff around when things don’t go their way (see: 2014 Washington Nationals). They don’t get too high or too low….until the job is done and it’s time to celebrate. When you know you’re going to win it’s a fairly huge advantage over your competitors. And no one out-manages Bruce Bochy in the post season. TGC: Every postseason, and each World Series win, was different. In 2010 the Giants had very talented, young pitching and just enough offense to support that pitching. The 2012 San Francisco Giants were flat out one of the best teams in baseball, and sealed that by sweeping Detroit in the World Series. The 2014 Giants were a poor performing team who managed to make the playoffs as the 10th best team out of ten. Without the individual performance of Madison Bumgarner throughout the playoffs, the Giants would have been eliminated early. C70: What’s the weakness of the team? TGC: Every team has weaknesses, but the 2015 Giants have four areas of concern that can’t be fixed with a couple of deals at the trade deadline. Starting pitching, long the foundation of the franchises’ recent success, has flattened out. Bad contracts with Tim Lincecum, Jake Peavy, and Ryan Vogelsong coupled with an older, injury-prone Tim Hudson, and .500 starter Matt Cain don’t bring a lot of support to ace Madison Bumgarner. Second, team run production, which was barely acceptable last season, is weaker than it’s been in years. In 2015, finding enough offense will be an ongoing challenge for the Giants. Third, the Giants’ bench is constructed on the “fill-in” theory. These are “extra” players who aren’t good enough to start, but who also aren’t professional hitters who can be difference-makers in the late innings of close games. Last, and maybe most concerning, is the team’s minor league system. There are few prospects on the farm who could either, 1) help the big league team; or, 2) have enough value to be trade chips. Baseball America, Baseball Prospectus, and the MLB Network’s top 100 prospects in baseball have two Giants on their lists (and in the last half). The Giants farm system has consistently been rated one of the worst in the game. 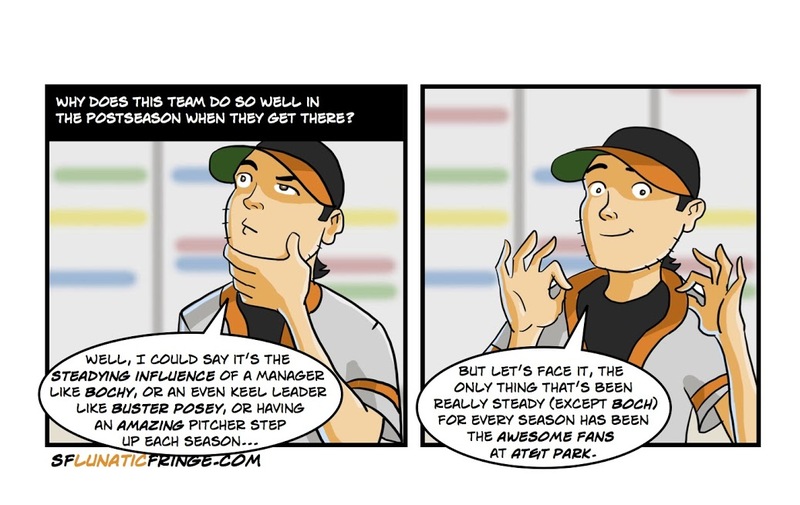 TSFGB: I mean, they just won yet another World Series with most of the same guys from the one they won before this one. I’m not sure there are too many more strides to take. Brandon Belt is the obvious choice, should he remain healthy…..
TGC: For the last three years, Brandon Belt has been the perennial pick to “break out”. Belt will be 27 this season and if he doesn’t finally move up to the next level in 2015 his value will quickly start to diminish. Second baseman Joe Panik proved his worth as a rookie in 2014, both defensively and as a singles hitter. But the Giants will eventually have to find some power bats to compliment Buster Posey. C70: What’s your projection for their record in 2015 and where will they finish in the NL West? TSFGB: Probably another 88 wins or so, 6 games back of the Dodgers. And another World Series win from the wild card slot. TGC: The goal for the Giants in 2015 will be to finish above .500, which I think they can do. The Dodgers will take the NL West, but San Francisco could also be challenged by the emerging San Diego Padres. The real problem for San Francisco in 2015 is the sheer number of quality “second tier” teams in the League– Miami, Pittsburgh, Milwaukee, Chicago, the Mets, and the Padres. C70: What do you like best about being a Giants fan? TSFGB: The knowing dude head nods I get to partake in with strangers on the street on a daily basis. Through association, we are world champions, multiple times over the last 5 seasons. We don’t take it for granted. But we’ll ride this supernova till it burns out. The trophies, however, will never fade away…. 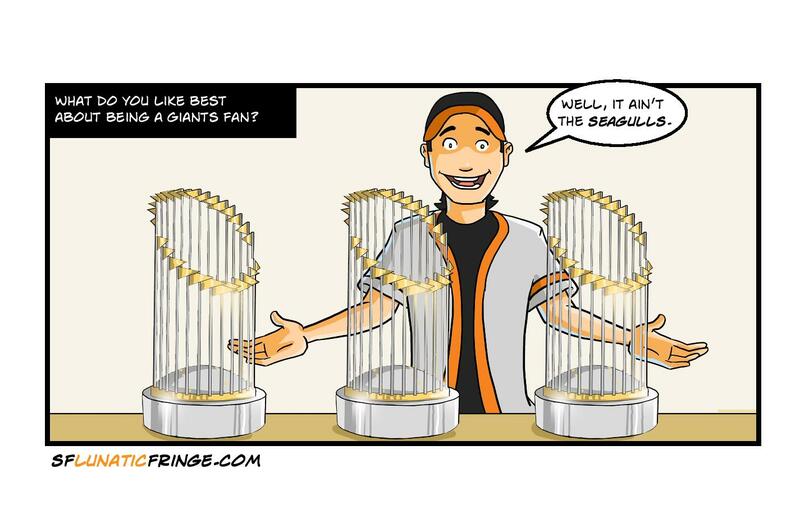 TGC: There is no one thing I like best about being a Giants fan. I love the team’s rich history; I savor the 2010 and 2012 Championships; my seat partner and I relish being season ticket holders at the stunning and beautiful AT&T Park; and I like those lovable, wacky Giants fans. My thanks and appreciation to Craig, Richard and Kevin. If we meet again in October, though, I’m hoping for a different ending!